The first champion of popular right in England was the sainted Thomas a Becket, Archbishop of Canterbury, himself, however, of Norman lineage, who led the first combination against the Plantagenet tyranny, and who in consequence was basely assassinated by the contrivance of the monarch, Henry II (A.D. 1170). He has been characterized as an ambitious churchman, solicitous only to advance his own personal interest and the interest of the Church, by ignorant men who had only a superficial knowledge of the history of the time. Those who really know the history of England of that day know only too well that Thomas a Becket was an honest, upright, heroic champion of Anglo-Saxon right and the sacred cause of humanity against the ablest and probably the most unscrupulous monarch of the Angevin, or Plantagenet race. He was not more a martyr of religion than he was of freedom and justice. Thomas a Becket found a worthy successor in Stephen Langton, also Archbishop of Canterbury, Primate of England, and Cardinal of the Roman Church. In his time, in the reign of King John, who has usually been designated as the weakest and the worst of the Plantagenet race - although it is not very apparent that, though he may have been weaker, he was any worse than his unprincipled father Henry II, or his equally unprincipled brother Richard Coeur de Lion - the aggressions of the monarch became intolerable, and the barons and the clergy and the forces of the city of London combined to resist them. The combination culminated on that famous day at Runnymede (A.D. 1215), when Langton, ably assisted by Pandolfo, the Papal Legate in England, and by all the archbishops and bishops of England, and by a large body of the barons, constrained King John to sign the Magna Charta, or Great Charter, ordinarily and perhaps not without justice assumed to be the foundation of English freedom. Stephen Langton, who was undoubtedly the author of the document, had the degree of Doctor of Laws from the University of Bologna, and was therefore a doctor of the Roman Civil Law. From this source, and not from English Feudalism, he derived his inspiration. The Magna Charta may be said to stand in the same relation to English Law and English institutions as does our Federal Constitution to the jurisprudence and the institutions of the United States. It is understood that it did not receive the name of the Great Charter which it bears on account of any supposed intrinsic merit, but that it was so called to distinguish it from another charter granted at or about the same time, and sometimes printed and included in it as part of it, which is desig�nated as the Charter of the Forests. 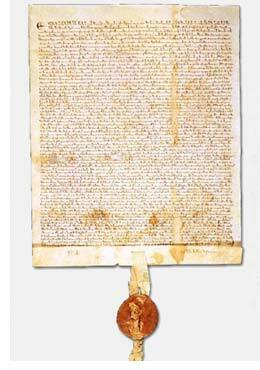 The Magna Charta, as usually given, contains 38 articles - with the Charter of the Forests included, 63 articles. Of these many have become obsolete, having passed away with the Feudal System, the abuses of which they were intended to remedy. Only three can be regarded as of paramount and permanent importance. These were: 1. That the Church should be free; 2. That the city of London and all the other cities and boroughs of the kingdom should enjoy their ancient rights and privileges unimpaired; 3. That no freeman should be deprived of life, liberty or property, except by the legal judgment of his peers or by the law of the land. There was nothing in either of these three provisions of the charter, or indeed in any other provision of it, which was not already established law everywhere else in Europe. And so, although England is justly proud of its Magna Carta, its pride should be tempered by the consideration that at that time, England was far behind all the remainder of Europe in the amount of liberty which it enjoyed. The provision for the freedom of the Church appears in the very first Article, and is again reiterated in the last Article of the charter. It means greatly more than it appears on its face to mean, while it shows that the charter was the work of Stephen Langton and the bishops to a far greater extent than it was that of the barons. In England, as everywhere else in Europe during the days of Feudalism and Feudal tyranny, the Church was always the champion of the people and of popular right against the feudal barons and the kings and emperors of the time. Only gross ignorance or blind bigotry can deny this fact. The freedom of the Church therefore also meant the freedom of the people; and this in England meant mainly the freedom of the Anglo-Saxon people as distinguished from the Norman barons and their retainers. In fact, it is not at all certain that the majority of the Norman barons of England were opposed to King John at Runneymede. It is evident from Magna Charta itself that it was Langton and the bishops, and the representatives of the city of London, aided by the Papal Legate Pandolfo, and not the Norman barons, who wrung the Great Charter of English freedom from a reluctant monarch. The Norman barons deserve very little credit for it. There was a significance also in the confirmation of the ancient rights and privileges of the city of London. It is unnecessary to go beyond the work of Blackstone to ascertain that the city of London was not governed by the law of Feudalism, or by the Common Law of England, but was a law unto itself, with its own usages and customs, and its own special courts to enforce them. It is necessary, however, to go a little beyond the work of that able, but not wholly honest commentator, to learn the fact that the usages and customs of London were traceable to a Roman source and to the Roman Civil Law. The city of London was a body corporate, like all the other great municipalities founded by the Romans; and the Feudal Law was incapable of comprehending corporations, either public or private. Municipal corporations in fact were an abomination to Feudalism. The confirmation of the privileges of the city of London, therefore, meant not merely a check to monarchical tyranny, but even more a check to Feudalism and to the law evolved from Feudalism. It is curious to note that, although the reasons for the perpetuation of the special privileges of the city of London have long since ceased in consequence of the general adoption of the principles of civil liberty throughout the country, there are remnants of those special privileges yet in existence.